I have been longing for some rural autumn feels this Halloween season, and I think I found just the place for my next ghoulish getaway! Bear Valley Farms in Big Bear City, California is hosting a Halloween haunt called Scare Valley Farms and it sounds absolutely incredible! I would love to spend a weekend in Big Bear and check out Scare Valley Farms' Halloween haunt, which is open now through November 2nd and features 30 acres of fearsome fun including terrifying haunts, hayrides, and live executions (eeeek, don't lose your head!). Check out the press release below and visit this eerie event up in the macabre mountains of Southern California! BIG BEAR CITY – Bear Valley Farms is bringing back its annual Halloween Haunt, this time under the banner of "Scare Valley Farms." A highly-produced haunt created in partnership with RWB Party Props, known for such haunts as Queen Mary and Universal Studios, Scare Valley Farms aims to terrify guests from mid-September through just after Halloween. 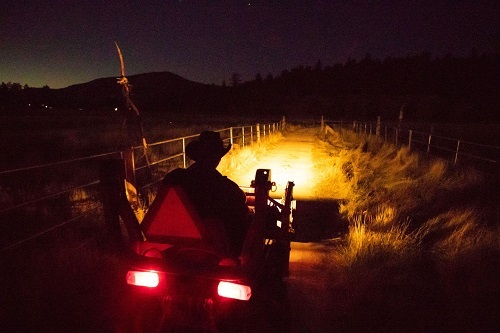 With the 30-acre Farm converted to a truly frightening experience, guests will travel back to the early 1900s making their way through a haunted ghost town, mine shaft and cemetery, creepy carnival, skin-crawling hillbilly hayride, terrifying slaughterhouse, undead swamp, and more, all before witnessing live executions. Guests purchase tickets according to the time and date they would like to attend. The Haunt is appropriate only for ages 12 and up (with adult supervision), unless visiting during Twilight Times when there will still be daylight and actors will not actively frighten guests. Peak days and times do sell out. Tickets vary from $20 to $35 per person and are available at scarevalleyfarms.eventbrite.com. "We were so pleased with the success of last year's sold-out haunted hayride that we decided to build on this year’s Haunt in a truly big way," said Bear Valley Farms co-owner and Haunt organizer Mike Carter. "We drew thousands of guests last year and realized that Big Bear can truly be a destination for a world-class haunt," he added. "Our partnership with RWB Party Props, and their years of building high-level haunts and other experiences, enables us to produce something truly incredible that will put Big Bear and Scare Valley Farms on the map for haunt seekers everywhere." Scare Valley Farms will be operating every weekend from Saturday, September 15th through Friday, November 2nd. Tickets are sold in half-hour increments from 6:30 pm to 10:30 pm. A limited number of tickets are sold per time slot to ensure that guests will access the entire experience, especially the hayride. The first two ticket times are considered Twilight Hours, appropriate for school-age children, and will include a stop at the Farm’s pumpkin patch. The remaining times are described as "truly terrifying" by organizers and not recommended for children under 12 or anyone at all fearful. Carter said, "There will not be refunds and we will not stop or turn any rides around because of frightened guests," he added. "Everything that we’re creating is meant to be the stuff of nightmares," he said. Guests are encouraged to wear closed-toe shoes and to dress warmly. Free street parking is available. Purchasing tickets online is the best way to ensure entry: scarevalleyfarms.eventbrite.com. Please call (909) 547-5424 or email bearvalleyfarms@gmail.com with any questions. For more info, you can also visit Bear Valley Farms' website and Facebook page!